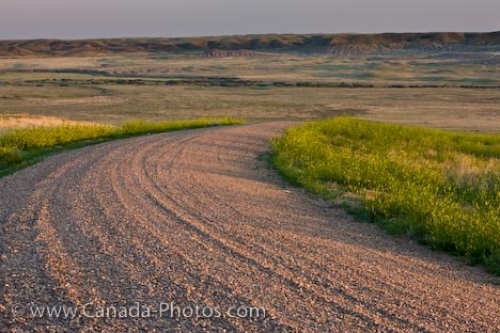 A gravel road winds through the landscape of the Frenchman River Valley in the West Block of Grasslands National Park in Saskatchewan, Canada. As you drive through the valley, the landscape appears similar to that of 100 years ago with new growth that has been re-established and many species of wildlife which are slowly being reintroduced to this region. Grasslands National Park is split into the East Block and the West Block, the Eastern side displaying a rough, rugged landscape which has been eroded over time. Most of this section is still privately owned, while the West Block offers guided tours which covers approximately 18 miles along this gravel road. Picture of the gravel road in the French River Valley in Grasslands National Park in Saskatchewan, Canada.